If you are looking for a homemade treat to leave for Santa, these Eat Fit-approved truffles are sure to do the trick. In a food processor, add the melted coconut oil, honey, vanilla, peppermint oil, and sea salt. Blend until well mixed. Add 1 cup of the coconut flakes and pulse to combine. The coconut flakes will break up into small pieces. In a mixing bowl, sift the cocoa powder and then add half the cocoa to the coconut and honey mixture. Pulse to combine. Add the remaining half. Pulse again quickly to fully incorporate. Pour the mixture into the same mixing bowl used to sift the cocoa. Chill in the refrigerator for 10 minutes. In a blender add the remaining 1 cup of coconut flakes and blend until it resembles, smaller flakes -- almost like snow. Pour the coconut crumbs onto a plate. 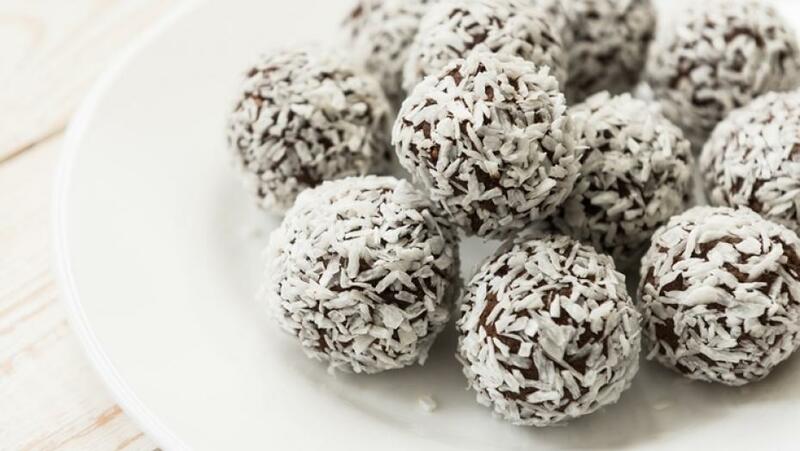 Using a tablespoon, scoop the truffle mixture and roll into a ball in your hand. Roll into coconut crumbs. Store in an airtight container in the fridge until needed.